I collected most of the original series — I’m pretty sure I still have them put away somewhere — and I stuck with it for one or two expansions. 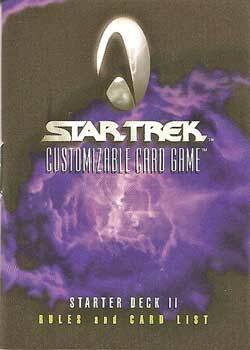 I’d quit before the First Contact or Deep Space Nine expansions came along though, so I never got to see those cards. The Second Anthology box that I picked up for $12 included six promo cards, a pair of starter decks, and six booster packs: two each from the First Contact, Deep Space Nine and The Dominion expansions. 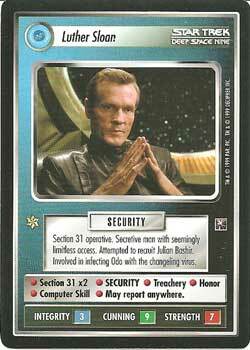 Luther Sloan, played by veteran actor William Sadler, was the face of the mysterios Section 31 in a couple memorable episodes late in Deep Space Nine’s run. I haven’t a clue what anything on his card means, but he’s got a lot of text and I imagine he’s a good card. 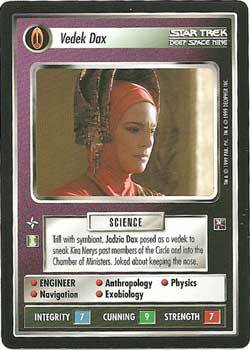 Vedek Dax, an alternate card for Jadzia Dax, also comes to us from Deep Space Nine. I have to admit, I don’t remember the episode where Jadzia disguised herself as a Bajoran priest. But hey, it’s a main character card… kinda. 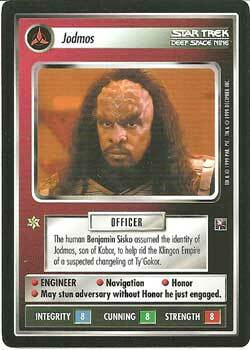 Captain Ben Sisko disguised himself as a Klingon for one of the seaon-opening episodes after Worf joined the show and they started de-emphasizing the Bajorans in favor of more Klingon stories. 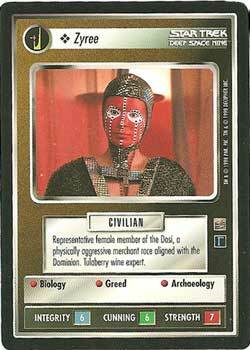 I can tell it’s Avery Brooks under all that makeup, so I guess I can count this as another main character card… I guess. Koval… I don’t really remember you at all. 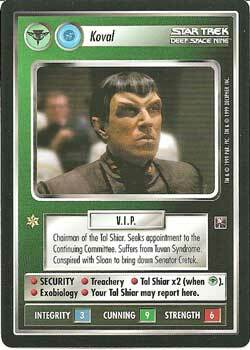 The card says you were the head of the Tal Shiar (the Romulan KGB) and you’ve got a ton of text on your card and dual Romulan and Federation icons. This must be a cool card if you can still find anyone who wants to play the game. 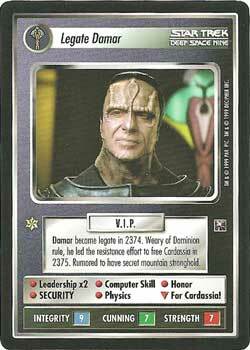 Legate Damar, the Cardassian alcoholic who found himself in charge once the Dominion War started to go badly and Dukat went bonkers. The Bashir Founder. 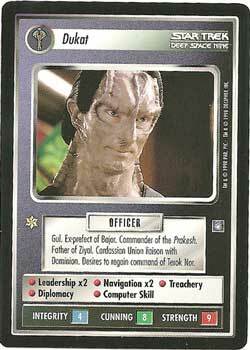 One of the worst ideas that the Deep Space Nine writers had during the Dominion War. 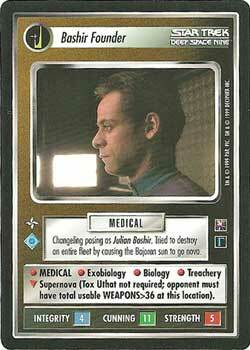 At some point, annoying Dr. Bashir got replaced by a shapeshifter who planned to infiltrate Deep Space Nine and cause the Bajoran sun to go supernova, destroying the system. The real Bashir later returned, mostly unharmed, and continued to be annoying. The less said of it, the better. 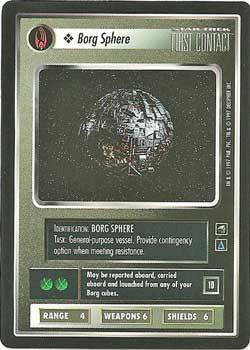 A Borg Sphere… the Borg certainly liked their geometric shape designs. 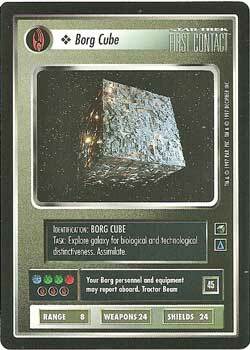 Remember the part in First Contact when Capt. 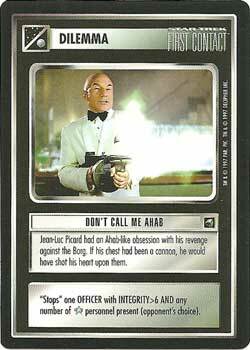 Picard goes into the holodeck and starts shooting the invading Borg with a Tommy Gun? This card makes use of that moment in some fashion, but I haven’t a clue how it works. 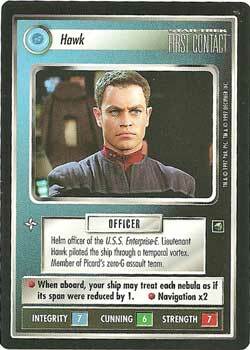 This is about as close as I got to getting a card of any major Next Generation crew member. Remember Hawk? 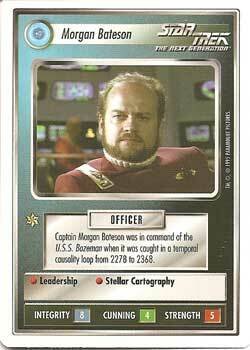 It should have been clear to everyone that when the writers introduced a new bridge crew member, he was not going to make it through the movie. If you made it to the end of this (incredibly) long, rambling post, I congratulate you. Going through this box brought back memories, both of the show and the time that I played the game. 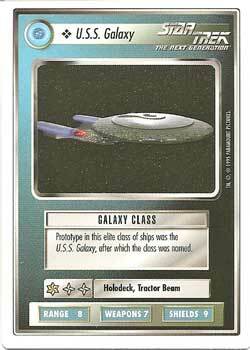 It also reminded me of part of the reason the game wasn’t fun – even Star Trek nerds would rather play with cards of the stars than the scrubs.